A chamber beneath the Roman arena, where bodies of dead gladiators, and other dead bodies, were dragged and later disposed of by burial or whatever was decided by Roman officials: "Historically, spoliariums were ancient Roman places where slaves dragged the bodies of dead gladiators from the arena for later disposal or burial." A species of protozoan the shells of which become calcium carbonate: "The fine sand on the beach was really composed of Sarcodina; the beach could technically be considered a stercomarium, a storage place for Sarcodina." A small "sweat cloth" upon which Jesus Christ, is said to have miraculously impressed His own portrait as He was wiping His face with it when He was going to the crucifixion. In the Roman Catholic Church, sudarium is another term for Veronica's Veil which is a legendary Catholic Church relic. The faithful believe that Veronica from Jerusalem encountered Jesus along the Via Dolorosa on the way to Calvary. When she paused to wipe the sweat off his face with her veil, his image was imprinted on the cloth. The event is commemorated by one of the Stations of the Cross. According to legend, Veronica later traveled to Rome to present the cloth to the Roman Emperor Tiberius. It had miraculous properties, including the quenching of thirst, restoring blindness, and sometimes even raising the dead. The warm, tepidus, a warm bathing room of the Roman baths heated by an underfloor heating system: "The specialty of a tepidarium was the pleasant feeling of constant radiant heat which directly affected the bathers from the walls and floor." "The Tepidarium in the Roman thermae was a great central hall around which all the other halls were connected, and it provided the key to the setup of the thermae." "The tepidaria were probably the halls where the bathers first got together before going through the various hot baths (Caldaria) or taking the cold bath (Frigidarium)." 1. A small enclosure or closed container in which selected living plants and sometimes a vivarium for small land animals; such as, turtles and lizards, are kept and observed in a simulated natural environment; as distinguished from an aquarium for aquatic animals: The teacher arranged for someone to take care of the terrarium during the holidays and to water the various plants which grew in it. 2. A sealed glass container often in the shape of a globe that is used for growing ornamental plants that require a high level of humidity: Dina's aunt had two large terraria in which she grew exotic plants in her solarium. 3. Etymology: from Latin terra, "earth" and modeled on aquarium; because it was designed as a place for land animals instead of water creatures. 1. Small containers used for holding oils and other ointments associated with ancient Greek or Roman civilizations: "Many of the unguentaria were often constructed with ceramic or glass and found in tombs." 2. Etymology: a term commonly applied to ancient Roman toilet bottles; however, it appears that the term was "invented" in the 19th century, on analogy with unguentarius ("perfume seller") and similar Latin words that the Romans used in connection with perfumes." 1. A game in which letters are formed into words; also, one in which a word is changed into others by re-arrangement of its letters: "The daily newspaper frequently published verbaria to challenge the word skills of its readers." 2. A dispute or dialogue which may be verbal or written, typically involving issues regarding words and word usage: "The two editors of the latest dictionary engaged in a good humored verbarium over the definitions of some words and phrases." The part of the ovary in some invertebrates; for example, certain flatworms, that produces yolk-filled cells providing nourishment to the developing eggs: "The students used a fine scalpel to dissect the large flatworm in order to observe its vitellarium." 1. Specifically constructed enclosures designed to simulate the natural habitat of plants or animals, intended to facilitate the observation and study of vegetation and/or creatures: Among the Latin scholars in Aaron's high school, the local zoo was referred to as the town vivarium. 2. An artificial habitat for the study of small animals, typically made of a glass or transparent material: The vivarium in Jim's classroom was made of a discarded aquarium and was used as a formicarium so the students could study the habitat and habits of ants. 3. A place in which animals are housed, particularly animals used in medical research: The antivivisectionists regularly picketed the university vivarium, protesting the use of animals in medical research. 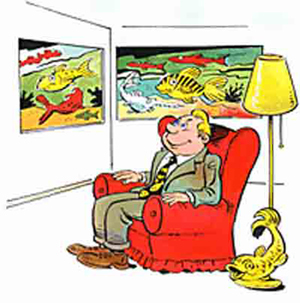 Here's an example of someone who is enjoying his vivariums in his home. Any organic body or cell capable of spontaneous movement; such as, zooids or animals: "Using a high powered microscope, the students were able to identify several types of zoariums." Showing page 3 out of 3 pages of 40 main-word entries or main-word-entry groups.